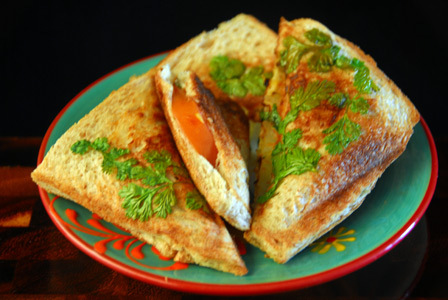 This is quick bread sandwich which can also be prepared on flat pan instead of sandwich maker. Cilantro chutney is used as a spread for burst of flavor. Fresh slices of tomato and onion are layered for freshness. 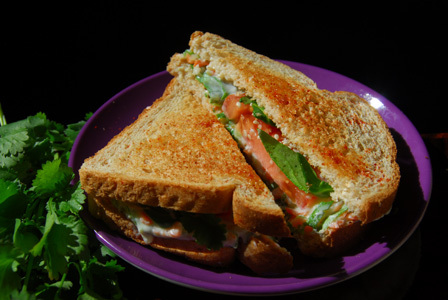 Serve quick bread sandwich with tomato ketchup. Discard the ends of the bread slices. Spread half of cilantro chutney over the bread slice. Layer the bread slice with onion, tomato, sprinkle a pinch of salt. Close with the other bread slice and garnish with cilantro. Repeat the same with other 2 bread slices. Apply little bit of oil on top of the bread slices on both sides. Place the both sandwiches on the sandwich maker and close it. Serve quick bread sandwich with ketchup. Notes: Make sure sandwich is toasted well. Suggestions: You can also toast the sandwich on a flat pan over a stove top. Once toasted, it can be cut into half. Variations: Check other bread recipes here. Other Names: Quick Bread Sandwich. Wheat or white bread is chopped up and soaked in yogurt mixture. Onion is chopped and fried in oil along with whole spices. Soaked bread is then cooked along with onion till done. 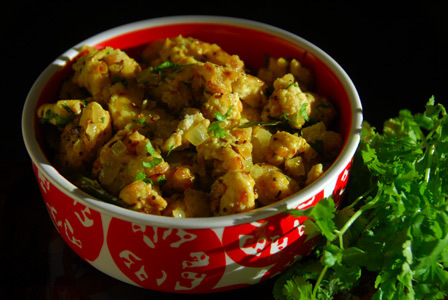 Stir in cilantro and serve bread yogurt upma. Makes: around 2 Servings of Bread Yogurt Upma. Discard the outer edges and roughly chop bread slices. In a mixing bowl, whisk together yogurt, few tablespoons of water and salt. Stir in chopped bread and keep aside. Heat oil in a pot, add all talimpu ingredients in order. When onion turns little brown around the edges, lower the heat add yogurt soaked bread and turmeric powder. Mix carefully and let the bread cook for couple of minutes. Stir in roasted peanuts, cilantro and serve bread yogurt upma. Notes: Make sure not to over mix the bread yogurt mixture. Suggestions: Make sure not to add too much water while whisking yogurt. Variations: Check other recipes with here. Other Names: Bread Yogurt Upma. Potato is cooked and mashed. It is then briefly cooked along with spices and onion. The potato mixture is stuffed in damp bread and deep fried in oil till brown in color. Garnish with cilantro and serve deep fried potato bread bonda with green chutney or sprinkled with chaat masala. 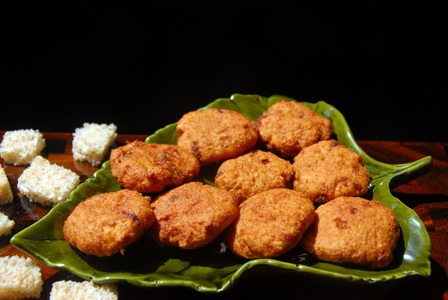 Makes: 5 Potato Bread Bonda. Bring few cups of water to boil in a sauce pot. Add halved potatoes and boil them till cooked and just soft. Cool the potatoes a bit and peel them. Remove stem, wash and finely chop the green chiles. Heat oil in a pan, add cumin seeds, curry leaves and asafoetida. When cumin seeds start to change color, add chopped onion and green chiles. Fry till onion turns translucent, add green peas, mashed potatoes, turmeric powder, cilantro and salt. Cool the potato mixture to room temperature. Take a big scoop of the prepared potato mixture and form into soft round ball. Repeat the same with remaining mixture and reserve all the potato balls for later use. Remove the ends and wet the bread slices. Stuff each slice with the prepared potato mixture. Fold the bread to cover the potato stuffing and keep aside. Repeat the same with remaining bread slices. Carefully leave the potato bread ball into hot oil. Fry on both sides until it turns into light golden color. Remove onto absorbent paper and repeat the same with remaining potato balls. 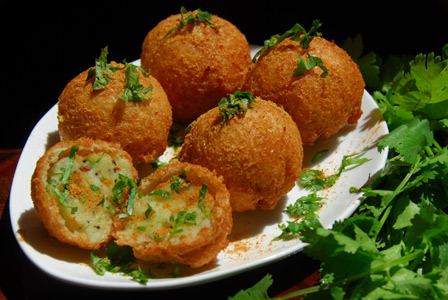 Garnish with cilantro and serve deep fried potato bread bonda with green chutney or sprinkled with chaat masala. Notes: Make sure to fry the bread bonda well. Suggestions: Make sure not to overly wet the bread slice. In such a case leave it to dry for couple of minutes. Also, make sure to cook the potato well. Variations: Check other recipes with potato here. Other Names: Potato Bread Bonda. Perugu Pachadi tho Bread Sandwich. Raita is prepared by mixing thick yogurt with grated vegetables like carrot, cucumber and bell pepper. It is then layered on a toasted bread slice along with spinach and tomato slices. Serve raita sandwich immediately. Makes: a Serving of Raita Sandwich. Wash, lightly peel and remove the seeds inside the cucumber before grating it. Wash, peel, remove ends and grate the carrot. Wash, remove ends, discard seeds and grate the bell pepper (capsicum). Dip tomato slices in toasted sesame seeds and keep aside. Use a food processor to grate the vegetables or grate them using thick side of a stand grater. Toast the bread in a toaster or on a flat pan till it turns golden brown and crisp. Apply ghee to the bread and sprinkle salt and red chile powder on one side to taste. In a mixing bowl, mix together grated cucumber, carrot, bell pepper, cilantro black pepper powder, lemon juice and salt. Leave for a minute or two to let the flavors penetrate and stir in thick yogurt to finish off the raita. To prepare the sandwich, layer the bread slice with 2 spinach leaves. Layer with few tablespoons of prepared raita. Layer the raita with tomato slices and then the spinach leaves. Place the bread slice on top and cut the sandwich diagonally. Notes: Green Chiles are optional. Suggestions: Lightly squeeze out all the juices from the grated ingredients if planning to store the prepared sandwich for couple of hours. Strain the yogurt for couple of hours to remove all the water content and to make the yogurt thick. Variations: Use any mix of vegetables at hand to make the raita. Also use any kind of bread slice at hand.